I do it to try to fit into smaller clothes. It's been almost 6 years since the last time I gave birth, yet I still have some of my maternity clothes in regular rotation. I can say "it's because they're so comfortable!" all day long, but the truth is because I can't fit into my regular clothing anymore. 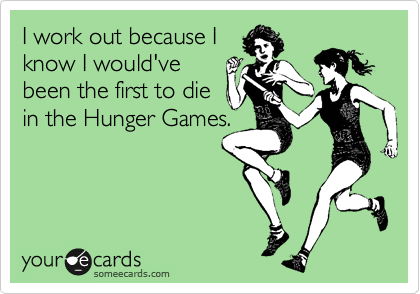 Love the hunger games motivation! My main motivation is health and shape, but I'd also like to be stronger to stand up for myself. Although I'm skinny nearly all my shape is flab so I'd like to replace that with muscle and definitely not lose any weight. DBF managed to grab a handful of flab from each of my cheeks which was a rude awakening for me to get back on it! When I was doing it regularly I really enjoyed it, but I lost weight and I'm scared of doing that again. I'm struggling to get back into it atm tho. I mostly do DVDs or go running, gyms intimidate me. Resurrection is a good thing, CaityBear! I should have said it before, but I do the high-impact aerobics and the low-weight training on doctor's suggestion, because I have osteoporosis and osteoarthritis (Yes, at age 32! Ugh!!!). So…I guess another motivation for me would be so that I can retain bodily movement. I also work out because I remember how good it felt to be so full of energy. I've been so down and depressed and generally sapped of energy lately, and I miss having the get-go to move around and do things. to be honest, my only motivation to work out is to look good. Being healthy is just a plus. Whenever I get lazy or need an extra shot of motivation, I look at a folder of pictures I have on my laptop, full of women I would like to look like. I try to pick people that have large hips like me so I can at least have a semi-realistic goal. It also helps to work out in front of a mirror, makes me want to work out longer. Unless it's zombies...although, cardio is pretty important when zombies are about. I hear it's Rule #1. Osteoporosis runs in my family so its a (preventative) motivation for me too. All this talk makes me want to go exercise! I exercise for physical and emotional health. My mood is much better when I exercise regularly. I get doleful if I don't. Also, I have arthritis in my back and even though it hurts to work out, overall, it brings down my pain level when I move about on a regular basis. I did it for me I love to lift weights. I feel great doing it.